From what I've heard, Bad Seed was an intentional throwback to the catchy Pop songs cartoons often had in the 60s and 70s. You know, like Scooby Doo and stuff. And for that, it gets some awesome points for me. I wonder if we'll ever get a real main villain song. By main villain I mean the kind we get in a season starter or finale, and by real song I mean, well, a real, big, awesome song. I'm hesitant to fully count This Day Aria because it was a duet with Cadance and Chrysalis wasn't in her real form, and Chrysalis's later dark reprise was only, like, a couple seconds long, so I don't think that really counts. "But for now we're stayin' out of her way 'til then." Yeah. Babs Seed wasn't exactly the strongest from a lyrical perspective. I can appreciate the simplicity of them considering it's being sung by the CMC. But I really can't excuse that particular line; it literally makes me cringe any time I listen to the song. I agree. I'd love to see a legit villain song from one of the future two-parters. Straight Disney-style. Emergency! Emergency! Sir, we can't hold back the floodgate of Disshy fics. I repeat. The Disshy fics are incoming! Now, seriously, I've read that it might be a fake summary since if Discord appeared again it would be most liekly in a two-parter. But I find this summary weird. If the summary is true, then it might turn Discord into an organized chaos? Or he'll flat out lie to everyone and mak Fluttershy cry at the end. Yeah, if anything that summary sounds like it'd make a fitting series finale, but not a regular old episode. I'm glad to see that you at least gave the show a try by watching a few episodes and even saying that it looks good as a kids show. I don't care if people watch something and say they don't like it, but don't say that you don't like something if you haven't even seen it. I wasn't very curios to watch it, but someday I found it on TV and I give it try. And as I said, it's not exactly my type of show, but I could watch it from time to time and enjoy it and for sure, if I have kids, I'll choose it for them, from, as I called it, new shows. It's on very high level in compare to what I watched with my younger cousin. Well if that is the case with Keep Calm and Flutter On that should prove to be a really great episode for sure and it would provide great characterization for Fluttershy as well. Next episode will be Spike's right? Yep. This Saturday is the Spike episode, then they're skipping a week, January 12th will be... something, and then the 19th will be the Fluttershy episode. Considering the synopsis, we could probably consider this a half Spike, half Applejack episode. I suppose so. Though I tend to consider episodes as being an "x/y/z episode" depending on who is the one most focused on throughout the story. And I have a feeling that most of the story will come from Spike's introspective POV. Kind of like how Putting Your Hoof Down had Pinkie Pie and Rarity in it almost as much as Fluttershy, but we still consider it to be purely a "Fluttershy episode". I'm kinda anxious. I mean I thought that Dragon quest was going to be great (one of the best of the show) given the summary and the first trailer, but it was an okay episode at the end (there was a lot of disappointment, though). While I'm dreading Spike at your Service to be on the same level as the owl episode (which was BAD). Maybe the episode has the opposite effect of my expectation. Maybe it'll be great, but the summary makes me believe it'll be the usual "you saved me? let me annoy the apples out of you by being your personal slave"
Can we please use some spoiler tags for my sake? I don't mind you all talking about who the episode is focused on, but when you get into any detail about the episode beyond that (Like, any. At all), I don't want to know before the episode airs. I'm not trying to sound selfish, and forgive me if I am, but I don't want to have to stop looking in this thread because a lot of other awesome stuff gets posted other than what the nest episode is about. I am excited that there is going to be another Fluttershy centered episode, but the fact that Discord is going to return in it is probably worked all the fans into a frenzy. But, maybe the inclusion of him as a reoccurring cast member will make for some good stories. The episode hasn't leaked. All we got from the next epísode was the summary that was just me theorizing abou what might happen. I'd have actually preferred this one. appart from the Lighting Dust still being a wonderbolt (wingpony or not), that would have been a better ending. Am I the only person who likes Owl's Well That Ends Well? Why did they change it? Its a better ending anyway, its not really majorly different theme wise; except its less ambiguous about Lightning Dust and if Rainbow Dash is on the Team. The only reason they likely changed it is because they wanted things to be more ambiguous about RD being on the Wonderbolts or not. 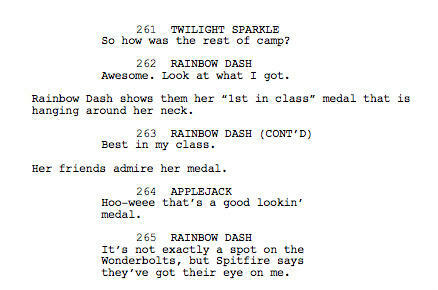 Though while its a better ending IMO making it ambiguous what happened to Lightning Dust and if Rainbow Dash is on the Wonderbolts doesn't hurt the episode at all really and ironically most people assumed this is what happened to both of them anyway well except a lot of people thought that Lighting Dust was kicked out of the academy. You know what after giving it some thought both endings are really good. Neither of them were worse then the other and really they both tell the exact same ending anyway, its just one is less ambiguous then the other. I thought it was ok definitely not as bad as people make it out to be, same thing with Mysterious Mare Do Well. I disliked Owl's Well That Ends Well because it made Spike act like a big jerk. For his fans like me that's the equivalent of MDW. Anyway, I like Owl's Well because it made Spike act like a jerk, simply in a believable manner, giving him some real character development by the end. But, to each their own. We can't ever forget that Spike is a child, and children are frequently immature. Another Episode Title Reveal Just for Sidekicks Its another Spike Episode and it seems likely to be the one were the CMC/Pets screen shot comes from. A lot of underrepresented characters getting episodes this season. I can't express how much I love that title. This sounds like a good premise. But I think it was done before in the show when Spike had to take care of Flutershy animals. edit: as someone said in another board: "I'm praying this doesn't turn out to be Baby Cakes 2.0 or Stare Master 2.0..."
Wait, what was wrong with Baby Cakes? When I read this, I first imagined a werewolf with wings lol, but that's pretty awesome!